Delicately scent your hands with our luxurious white Elderflower & champagne hand wash. It has been specifically designed to help leave your hands feeling clean and soft. Bayley's of Bond Street: Quintessentially British. 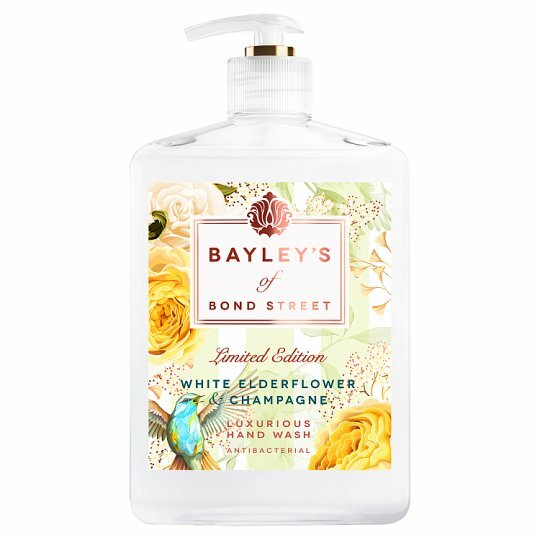 Bayley's of Bond Street dates back to the 1700's when William Bayley set up a perfumery shop in London, frequented by men and women of fashion. Our bespoke fragrances are inspired by the original perfume archives. Quintessentially British in style, with a dash of contemporary influence, they bring nostalgic beauty and decadence to you and your home. As with all cleansers, if the product gets into eyes, rinse well with water. WARNING: Avoid contact with natural stone surfaces and stainless steel.